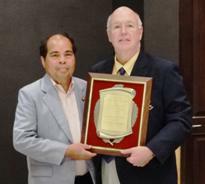 Share the post "Thai Alumnus Prasert Chitapong Wins Dennis Fenton Alumni Award"
Mark Robson (Entomology; dean of Agricultural and Urban Programs) traveled to Thailand to present the 2012 Dennis Fenton Alumni Award for Distinguished Achievement to Dr. Prasert Chitapong on behalf of the Cook Alumni Association and Executive Dean of the school Robert M. Goodman. Chitapong has had a very distinguished career since graduating from Rutgers, returning to Thailand where he’s served as Dean, then Vice President for Research, and President of the Prince of Songkla University in Hat Yai in the south of Thailand. According to Robson, “he transformed the university and moved it forward and modernized curriculum, increased the training opportunities for his faculty, and raised the standards for Thai higher education.” Chitapong was elected senator from the Songkla Province and “is now a member of the Thai Parliament in a time of extraordinary change and […] challenges in Thailand’s history,” added Robson. In 2003 the Cook Alumni Association named an award to honor distinguished alumnus Dr. Dennis Fenton, a microbiologist and former Executive Vice President of Amgen, who is a generous supporter of Rutgers University and the school.